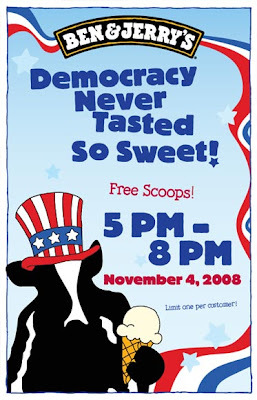 After you Vote on Tuesday Ben &Jerry's will give you free ice cream for a job well done. ...and as I side note, I went on the tour when I was in Vermont a few weeks ago, and the visual style and branding of this company has to be one of the very best - don't you think? From the cartons, to the posters, to the processing room - it's color and curves, and cow spots all over.